Notorious drug kingpin Joaquín “El Chapo” Guzmán has become the latest controversial fashion influencer as he faces various charges for two decades of highly-organized drug smuggling. 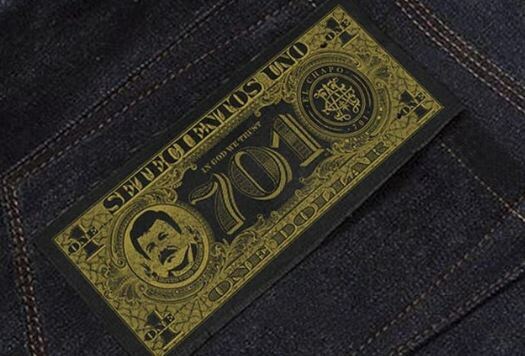 Sinaloa Cartel’s ring leader is not the first of such characters to be referenced in fashion, with countless brands taking note of the unique cartel and mafia culture. This time, Alejandrina Gisselle Guzmán, one of Chapo’s 10 known children, is the one doing it. Over the past several weeks she’s been marketing and promoting her eerily-inspired imprint “El Chapo 701.” Considering the drug lord’s spotlight in mainstream media, as well as a recent Netflix series, it seems the perfect time for her to capitalize off of his influence. Late last year she applied for two sought after trademarks, “El Chapo” and “El Chapo Guzmán,” being granted the latter in January, with “El Chapo” still pending. She’s already launched an official website as well as various social media accounts for the brand, which showcases a variety of upcoming products from jeans, jackets, t-shirts, tailored-shirting and suits, footwear, and hats. Aside from clothing, she’s also announced a line of liquors, jewelry, and other varying accessories.